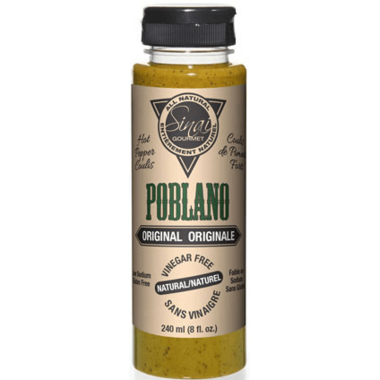 Sinai Gourmet’s Vinegar-Free Poblano Pepper Hot Sauces are ideal for those just starting with spicy food or for those with a lower heat tolerance. Locally made in Quebec with only the freshest ingredients, Sinai Gourmet products have no artificial ingredients or preservatives. Use the sauce raw, cook with it, grill with it... it's ultimately flexible! Made with real maple syrup. Why Vinegar Free? There is nothing wrong with vinegar in itself. 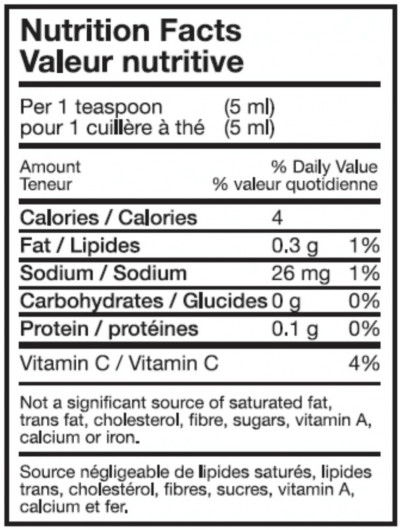 However, in the same way you put cucumbers (vinegar-free) and not pickles (vinegar) on your salad, sometimes it just isn’t necessary to add vinegar. So if you want to eat premium stuff – a good rib eye, a fresh piece of salmon, scallops, your grandmother’s signature spaghetti sauce – you now have an option of hot sauce that blends in and enhances rather than overtaking and changing. Ingredients: Fresh poblano peppers, fresh herbs and spices, fresh lime juice, extra virgin olive oil, fresh garlic, maple syrup.